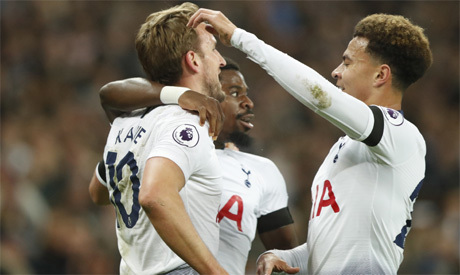 Tottenham Hotspur outclassed Chelsea 3-1 in the Premier League on Saturday to inflict a first defeat of the season on Maurizio Sarri's team. Dele Alli opened the scoring after eight minutes, heading in a Christian Eriksen free kick for his sixth goal in his last five games against Chelsea in all competitions. Eight minutes later it was 2-0 when Harry Kane was given time and space to drive at the Chelsea defence and smash the ball past a motionless Kepa Arrizabalaga from 25 metres. Chelsea came out more fired up in the second half but individual brilliance from Son Heung-min made it 3-0 to the hosts. The South Korean ran on to the ball from inside his own half, sprinted past Jorginho and took it past David Luiz before slotting coolly past Arrizabalaga. Sarri's men pulled one back late on through substitute Olivier Giroud who rose unmarked to head in a cross from Cesar Azpilicueta. But it was not enough to stop Spurs moving ahead of Chelsea into third place in the table.